Once a Silicon Valley software engineer, Curtis C. Chen now writes fiction and runs puzzle game near Portland, Oregon. 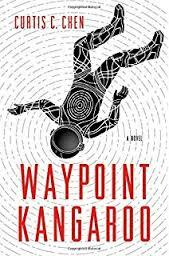 His debut novel Waypoint Kangaroo is a science fiction thriller about a superpowered spy facing his toughest mission yet: vacation. 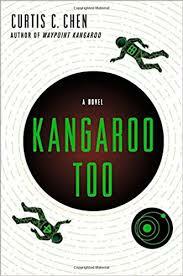 A sequel, Kangaroo Too, is forthcoming in 2017. Welcome, Curtis, and congratulations on the publication of your second novel! Without giving too much away, can you give folks unfamiliar with the series a little taste of Kangaroo’s world? Thanks, Alison! I imagine Kangaroo’s world as pretty much our current one, projected a couple of centuries forward. I’m not trying to predict the future at all; I just wanted interplanetary travel to be reliable and affordable for civilians in this world, because I’m a big space nerd and I would love to go touring around the Solar System, myself. There’s also other advanced technology, like Kangaroo’s bionic implants, but nothing always works perfectly, because engineering is hard. There’s something very evocative about the title of your first novel. Waypoint Kangaroo seems like a combination of words begging for story, so I have to ask (only semi seriously) – which came first, the concept or the title? And on a more serious note, what did spark your desire to write a sci-fi spy thriller? The title of the first book hasn’t changed since I came up with the basic plot. But before finding that specific story, I first came up with the superpower (the pocket) and then the character. Kangaroo became a spy because it seemed like a perfect job for someone who could smuggle anything anywhere, but I also made him a very atypical secret agent for comedy reasons. And the thriller aspect grew out of that, when I decided it would be funnier for Kangaroo to be dealing with more mundane problems in a science fictional world. Keeping with the spy theme, across any medium – tv, movies, books, games, or even reality – do you have a favorite spy? Have you ever fantasized about being a spy yourself, and do you think you’d make a good one? Yes, I’ll be at the Locus Awards! A friend is even custom-sewing me a Hawaiian shirt using a unique patterned fabric. I don’t expect to win either the First Novel award or the Hawaiian shirt contest, but I plan to have fun regardless. Hopefully you will at least share pictures of said shirt far and wide! In addition to your two novels, you’ve also written quite a bit of short fiction. How hard was it to make the transition between the two for you? Do you have different processes for writing for one length versus the other? I’ve been trying to write novels since the early 2000s, so it wasn’t so much a transition as finally figuring it out. For the longest time I was a pure “pantser,” depending on discovery writing to drive the first draft of any story, but at some point I realized I needed to work on structure. Looking at screenwriting turned out to be really good for that. In the 2010s I started outlining and breaking down my short fiction, and then I was able to apply those same skills to longer works. I’ve definitely moved toward the “plotter” end of the spectrum now. Now to topic switch entirely, I want to ask about the Portland area, since you’re a resident. I have an image of Portland (mostly drawn from Portlandia, I’ll admit) of a quirky city that fosters creativity and is home to a lot of makers, artists, and musicians. Do you find that to be true? Do you have a favorite spot in the Portland area where you go to get inspired, or a favorite place you like to take people visiting for the first time? Yeah, the first few seasons of Portlandia were pretty much a documentary. There are a lot of people here doing really interesting, independent creative work, and I’ve been able to get to know quite a few of them through local tech conferences, writing meetups, puzzling events, and the co-working space of which I’m a member. My wife and I always take visitors to see Powell’s Books, waterfalls and the Vista House in the Columbia River Gorge, and usually at least one of the local gardens (Rose, Rhododendron, Chinese, or Japanese). Now I want to visit Portland even more than I did before! Back to writing to wrap things up, now that Kangaroo Too is out in the world, what’s next for you? Any projects you’re working on you want folks to know about?